Based on what appears to be an accidental push of the button by EA Spain, a big new Dragon Age: Inquisition DLC entitled Trespasser will soon be released. The video, spotted by Eurogamer, was quickly pulled, but has reappeared elsewhere on YouTube. Trespasser is set two years after the events of Dragon Age: Inquisition, and looks set to carry the main story to a big finish, quite possibly the "last adventure" mentioned in a BioWare survey that leaked in June. "Having saved the world of Thedas by closing the Breach, your next mission will determine the future of the Inquisition," it said. "Your mark suddenly glows, erupting with magic connected to the Fade. Assassins attack in shadow. An invasion of enemies begins. Win a race against time to face a great evil before it is too late. In this story-based expansion, playable after the events of Dragon Age: Inquisition, you will embark on a last adventure with your team to confront the one who started it all." That doesn't sound too far off of what's in the trailer, does it? EA hasn't confirmed that the trailer is legit but assuming it is, we'll no doubt get official word on it soon: The video dates Trespasser for September 8, which is just a couple weeks away. We'll keep you posted. Update: BioWare has confirmed that Trespasser is indeed the next DLC release for Dragon Age: Inquisition, and also the last. As the trailer indicates, it's set two years after the events of the main game, and tells an entirely new story that "explores what it's like to be a world-saving organization when the world no longer needs saving." 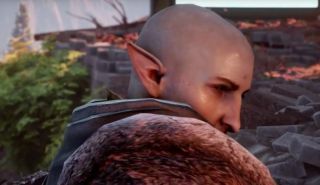 "It's a chance to meet and talk with old friends, to uncover a new threat, and ultimately decide the fate of the Inquisition you worked so hard to build," BioWare's Mike Laidlaw wrote on the Dragon Age website. "It might just contain hints about the future of Thedas, too." BioWare didn't confirm the September 8 release date, but did say that it's announcing Trespasser a bit earlier in the process than it did with previous DLCs because it requires a character who has completed the main campaign. And, since it's now official, I've replaced the leaked trailer we originally posted with the official one (which is the same, minus the Spanish subtitles) above.